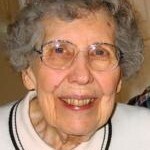 Linnea Ruth Elizabeth Swanson of Grace Village Retirement Community, 337 Grace Village Drive, Winona Lake, Indiana, passed away on Sunday, August 22, 2010 at 8:22 a.m. at Kosciusko Community Hospital, Warsaw, Indiana, at the age of 92. Mrs. Swanson is the mother of Dr. Jim Swanson, Vice President of Student Affairs and Academic Services, Grace College and Seminary, Winona Lake, Indiana. She was born on August 5, 1918 in Iron Mountain, Michigan, to Axel Bloom and Freda (Jacobson) Bloom. Linnea was married on September 3, 1949 in Iron Mountain, Michigan, to Leslie Edward Swanson, who passed away November 24, 2009. Linnea worked for the Army during World War II in Germany, and she was a homemaker. She was a member of Faith Covenant Church, Farmington Hills, Michigan, and attended Winona Lake Grace Brethren Church and Grace Village Chapel at Grace Village Retirement Community, both of Winona Lake, Indiana. She was a resident of Kosciusko County, Indiana, since 2005 moving here from Michigan. She will be lovingly remembered by her four sons: David (wife Pam) Swanson (Troy, Michigan); Daniel (wife Kathleen) Swanson (Warsaw, Ohio); Timothy (wife Colleen) Swanson (New Hudson, Michigan); and James (wife Patti) Swanson (Warsaw, Indiana). Also surviving are twelve grandchildren; eight great grandchildren; and one sister: Rose (husband Lloyd Lindman (Mt. Clements, Michigan). Linnea was preceded in death by her husband of 60 years, Leslie Edward Swanson, her parents, and sister Viola Aguilar. Visitation will be held Friday, August 27, 2010 from 10-11:30 a.m. with her funeral service to follow at 11:30 a.m. at Redpath-Fruth Funeral Home, 225 Argonne Road, Warsaw, Indiana officiated by Reverend David Swanson. Graveside services will be held Monday, August 30, 2010 at 1:00 p.m. at Oak Grove Cemetery, Manistee, Michigan. Memorial donations in Mrs. Swanson’s name can be sent to Grace Village Retirement Community, 337 Grace Village Drive, Winona Lake, Indiana 46590 and would be appreciated by her family.